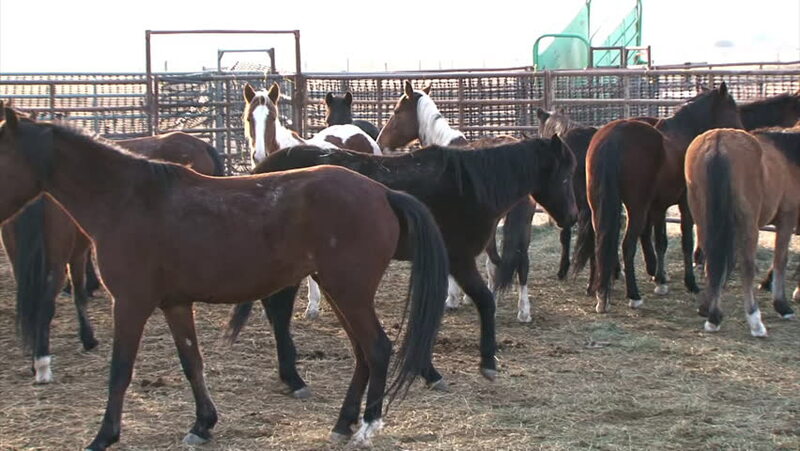 CIRCA 2010s - The Bureau of Land Management rounds up wild horses and loads them into pens and corrals. sd00:12A curious horse looks at the camera and then looks away. Other horses mill around in the background. Converted to NTSC from HDV 1080i60. hd00:13Two cows in a large pen, with one cow intruding on the others personal space. sd00:12Horses being playful with each other. Converted to NTSC from HDV 1080i60. hd00:11Holstein cows at a dairy crowd in close to the camera.